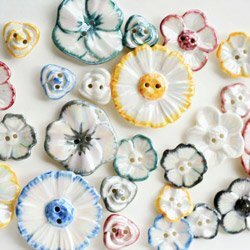 Whim Wham Buttons produce handmade ceramic buttons crafted using fine bone china, in Stoke-on-Trent the heart of the Potteries. As a heritage brand we pride ourselves on our craftsmanship and aim to make buttons fashionable again through design and quality. Our buttons also make great gift pieces.